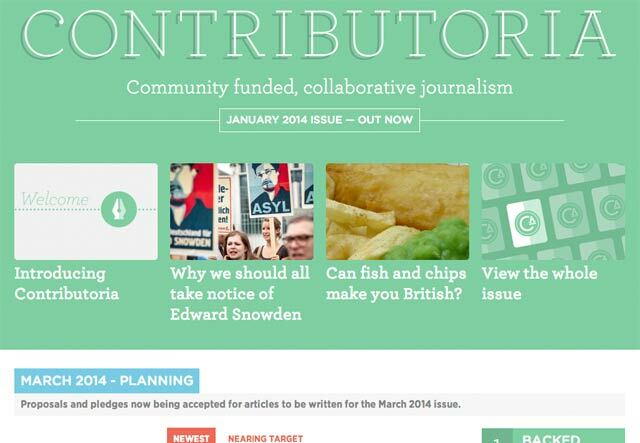 Contributoria is a community funded, collaborative journalism platform. It allows journalists to propose stories – along with how much it’ll cost to write/research them – and a community to back those proposals, follow them through to publication, and offer input. I came on board the project quite late, as a second pair of hands, to translate Dean‘s designs into front-end code, and start integrating them with Dan‘s back-end. I’m continuing to have some involvement at that level for a little while after launch, too; there’s still work to be done! But the seeds are sown. It’s going to be interesting to see how Contributoria grows – its very much a ‘live’ project at the moment – and it’s been exciting to play a role in it, however small, at its inception. And, of course, an excellent team to work with – thanks to Matt, Sarah, Dan, Dean, and all the writers who’ve already joined in.